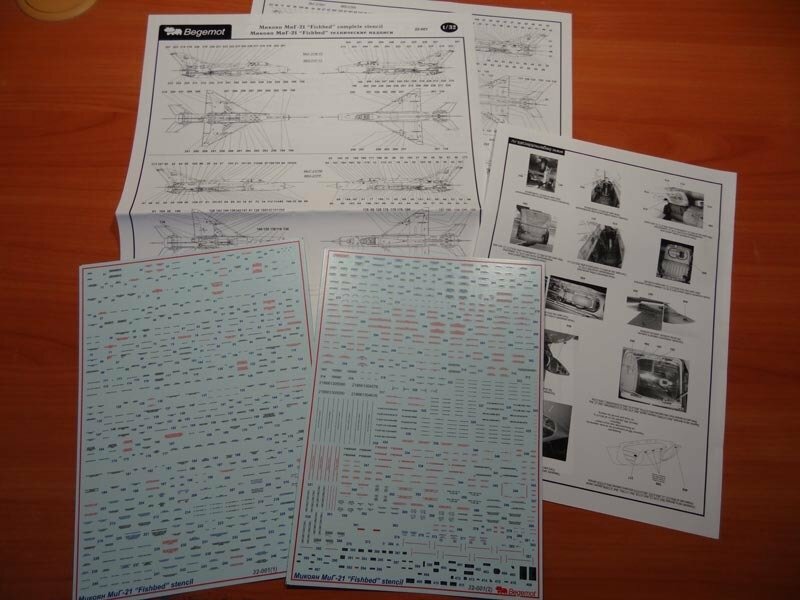 Russian language stencil for all MiG-21 version: MiG-21F-13, Mig-21PF, MiG-21PFS, MiG-21PFM early batches, MiG-21PFM late batches, MiG-21R, MiG-21SM(MF), MiG-21bis, MiG-21U, Mig-21UM and stencil for external armament and hard points (34 types) of all MiG-21 modifications. Also we add stencils for ejection seats, cockpits and information metal shields, which placed into cockpits, gear bays and other surfaces miG-21s. Including two big size decal sheets, 5-th pages big size instructions.